marketing materials of The Turtle were disseminated into the blogosphere and today, the first-ever photographs of Pure, and some specs for both phones, made it onto Gizmodo. The blurry shots of Pure reveal a pretty generic slider precisely like the one that appeared in the Verizon ad. 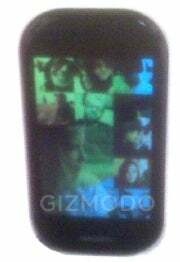 The UI -- which Gizmodo claims is "distinctly not Windows 7" -- has touchable squares for music, e-mail and RSS; uses Zune-esque typography; and is apparently a social networking hub that will feature all the connections to popular sites like Facebook and Twitter. It's a little odd, because better photos were leaked a few months ago. But the devices are still works in progress. Pure reminds me of a sleeker version of AT&T's Tilt, and The Turtle comes off like a blobby Palm Pre. Microsoft's Pink phones were touted as iPhone Killers, much like every single release of every single smartphone ever. "Why the initial rumors about Pink had such lofty hopes is anybody's guess, but it's laughable to consider either of these simple sliders as iPhone killers now," my colleague Jared Newman wrote. I couldn't agree more. I find nothing exciting about either phone, and these latest leaks do zilch to pique further interest.